Last Orders Movie Poster © Metrodome Distribution Ltd.
Last Orders is based on the novel of the same name by Graham Swift, and tells the story of how one man’s death affects the lives of those close to him as his best friends make a journey to pursue his final wish to have his ashes scattered at sea. Throughout the journey, Jack’s companions share their own individual memories of him and how he made an impact on their lives. Flashbacks are used throughout the film stretching through six decades telling the story of the group of London pals as they make their heart felt journey to say goodbye to their friend. Directed by Fred Schepisi (Six Degrees of Separation, A Cry in the Dark) and starring a host of acting talent including Michael Caine (The Italian Job, Batman Begins), Ray Winston (The Departed, The Sweeney), Bob Hoskins (Made in Dagenham, Ruby Blue), David Hemmings (The Rainbow Jacket, Gangs of New York), Tom Courtenay (Doctor Zhivago, The Golden Compass) and Helen Mirren (Calendar Girls, The Queen). Rochester was used as a stop off during the friend’s journey and you can see them drive over Rochester Bridge and also walk down the high street. Rochester is a historic City that boasts an impressive cathedral and castle and has many links with Charles Dickens. Previous productions to have filmed in the area include Long Lost Family (2012), The Mystery of Edwin Drood (2012)and Veer (2009). The Historic War Memorial in Chatham features in film for the scenes where the men stop off and reminisce about their time at war. Nearby, The Historic Dockyard Chatham is a popular location having been used for productions such as Dom Hemingway (2013) Call The Midwife (2012-2013) and Children of Men (2006). The Mount in Old Wives Lees was also one of the stop offs on the groups journey and is used for the flashback scenes of how Jack met his wife Amy. Neighboring village to Chilham, has a remarkable fifteenth century square of black and white timbered buildings and has been used for a variety of filming projects including Top Gear (2011), Channel 4 comedy Chickens (2011)and Miss Marple – The Moving Finger (2005). Canterbury Cathedral was used within the film as the characters make a stop to the grounds and look around the Cathedral. Canterbury is a vibrant City with parks and open spaces, shopping areas and neighbouring quaint, traditional towns. Previous productions that have shot in Canterbury include Goodbye To Canterbury (2013), Songs of Praise (2011) and A Canterbury Tale (1944). Margate features in the final scenes of the film where the men scatter Jack’s ashes from the harbor arm. Margate is a delightful seaside town with a sandy beach, harbour, arcades, and period housing. The Old Town has lots to offer including galleries, quirky shops and trendy cafes. Margate is a popular location having previously welcomed productions such as Mary Queen of the High Street (2013), BBC One’s improvised drama True Love (2012), The Apprentice (2009). 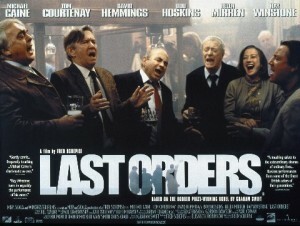 Last Orders was released in UK cinemas in January 2002 and is now available to buy on DVD. This entry was posted in Filmed in Kent and tagged Bob Hoskins, Canterbury Cathedral, David Hemmings, feature film, Helen Mirren, Last Orders film locations, Margate, Michael Caine, Ray Winston, Rochester, the Historic War Memorial in Chatham, The Mount – Old Wives Lees, Tom Courtenay. Bookmark the permalink.